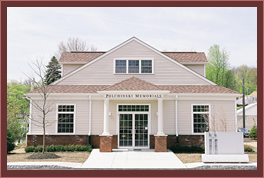 Contact Us | Polchinski Memorials, Inc.
Taconic Parkway South to the Bronx River Parkway South. Make a right at traffic light at Stevens Avenue to Polchinski Memorials, Inc.
Route 684 South to the Saw Mill River Parkway South. Take Exit 26 to the Bronx River Parkway. Make a right at traffic light at Stevens Avenue to Polchinski Memorials, Inc.
Cross Westchester Expressway (Interstate 287) to Exit 4, onto Route 100A North. Left off exit ramp. Follow 2.25 miles to Gate of Heaven Cemetery entrance. Proceed through the cemetery, following all signs for Cemetery Office. Once you see the Gates, proceed out of cemetery, make right turn and then immediate left up driveway to Polchinski Memorials, Inc.
Bronx River Parkway North to the Taconic Parkway North to Stevens Avenue. Make left at traffic light onto Stevens Avenue. Travel over the railroad tracks to our parking lot. Polchinski Memorials, Inc. is the building with the white columns. Sprain Brook Parkway North to the Eastview exit. Sign also says 100 and 100C South. Turn right at end of exit ramp onto Route 100C. Turn left onto Route 100 at the first intersection. Follow Route 100 North to cemetery entrance. Proceed through the cemetery, following all signs for Cemetery Office. Once you see the Gates, proceed out of cemetery, make right turn and then immediate left up driveway to Polchinski Memorials, Inc.